Maybe it was the recent announcement that Starbucks is set to install Bakkt’s crypto payment software in its stores, enabling customers to pay for their morning brew with crypto, but the crypto market was abuzz with excitement. EOS coin rallied over 10%, Ethereum was up over 5% and Bitcoin edged ever so closer to retesting the key $4,000 level. Interestingly, the Maker Dao ecosystem, which allows users to borrow dollar-pegged Dai tokens with ETH, has grown so much that, as it stands, over 2 million Ethereum tokens have been collateralized in its credit system. Despite the scepticism towards ETH, the CDP (Collateralized Debt Position) more than doubled in January to 1867 from 933 in December. One of the primary factors for this growth is the ability to leverage position by borrowing DAI and then using it to buy more ETH coins. This of course comes with greater risk, since the holder of the position may be subject to liquidation call if the price drops significantly. Staying with stablecoins, the team behind TrueUSD (TUSD) has launched a unique feature, whereby after getting verified, any TrueUSD user can send a minimum of 1,000 TUSD to their redemption address and then receive an automatic wire to their registered bank account. In other words, while some crypto exchanges may not have an actual fiat withdrawal option, a verified TrueUSD user will be able to send a withdrawal of TUSD coins to their redemption address, and receive fiat in their bank account. 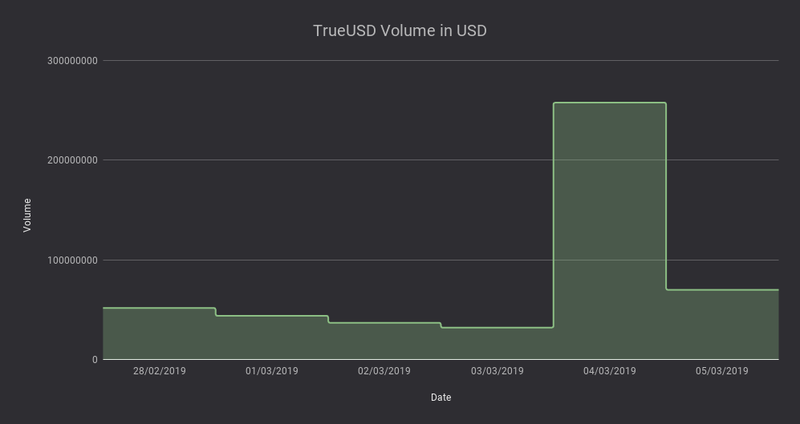 TUSD trading volume surged over the last few days to over $200mln (vs c. $50mln).